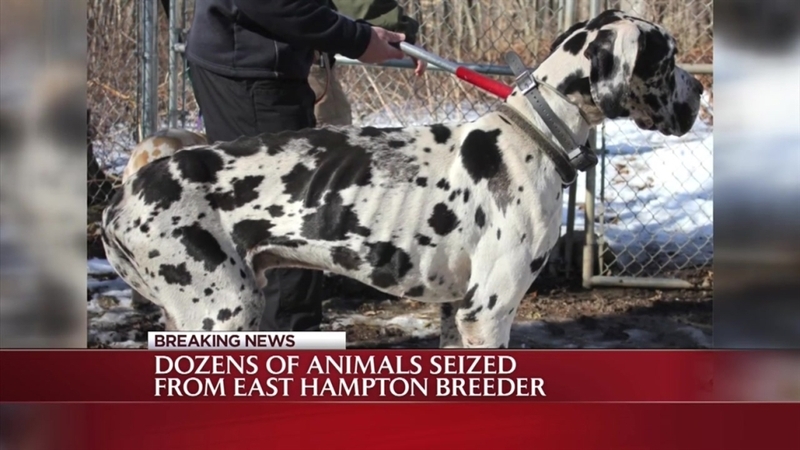 The Department of Agriculture seized several malnourished animals on Monday including 32 horses, 80 chickens, several rabbits and two dogs from a facility in Connecticut, the agency said. The investigation stems from a complaint filed in September by a woman who had leased four horses to the Fairy Tail Equine facility. The claim said after the woman picked up the horses they were hospitalized for malnutrition and parasites, a release from the Dept. of Agriculture said. Upon an initial assessment done on Sept. 10, according to the department, "nearly half of the horses on the property were underweight and exhibiting signs of malnutrition including muscle wasting, protruding hip bones and visible ribs and spine." The assessment also found no hay or grain for the horses. Fairy Tail Equine's owner was instructed by animal control officers to have hay and clean water for the horses at all times and to obtain veterinary care for "numerous" horses for cracked hooves, the release said. An evaluation later found that "several" horses had anemia related to being malnourished, Dept. of Agriculture said. The department said the owner was instructed to provide the horses with 200 bales of hay a week and was given a list of other feeding and treatment. Animal control officers making regular visits to the facility observed some horses had put on weight and other had not. On Dec. 4, animal control officers found the horses again without hay, grain or adequate water. Two horses drank "several gallons" of water immediately when officers poured it for them. During this time, the owner came back with a load of hay he had just picked up, officers told the Dept. of Agriculture. The Dept. of Agriculture said it will continue the investigation to determine if criminal charges against the owner are warranted. A warrant allowed the horses to be placed in the department's Second Chance rehabilitation facility in Niantic. The dogs, chickens and rabbits were taken to municipal shelters in nearby towns. A GoFundMe account has been set up for the animals' rehabilitation.